Col B: A star indicates a new author I have never read. Col D: If an entry is in Italics, I read it on my Kindle. A Commercial-At (@) indicates a re-read. Col H: Either a miniature Guatemalan flag for my vacation reading, or a 2-character country abbreviation. FR=France, AS=Asian, GE=Germany, IS=Iceland, IT=Italy, RU=Russia. Col I: My rating from 0 (worst) to 10 (best). Col K: Genre. FIC=Fiction, MYS=Mystery,BIO=Biography, TRA=Travel, SS=Short Stories, AA=Anthropology & Archeology, SFF=Sci-Fi and Fantasy, DRM=Drama, YAF=Young Adult Fiction, and so on. 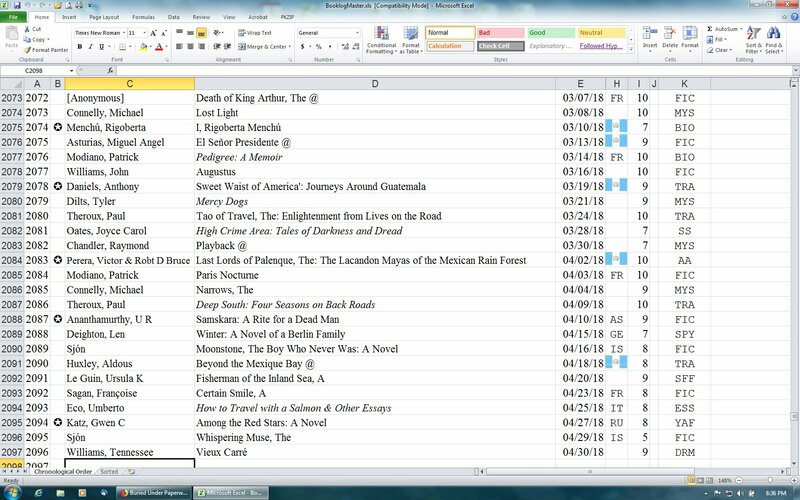 The first column is a counter indicating I have read 2,096 works since 1998, when I started. Now that I am retired (for now), I am reading more than ever. I give up. After I spent several hour looking for a piece of paper this morning, I have decided to order a Fujitsu Scanner so that I can keep my documents on the hard drive, the way I did at work. 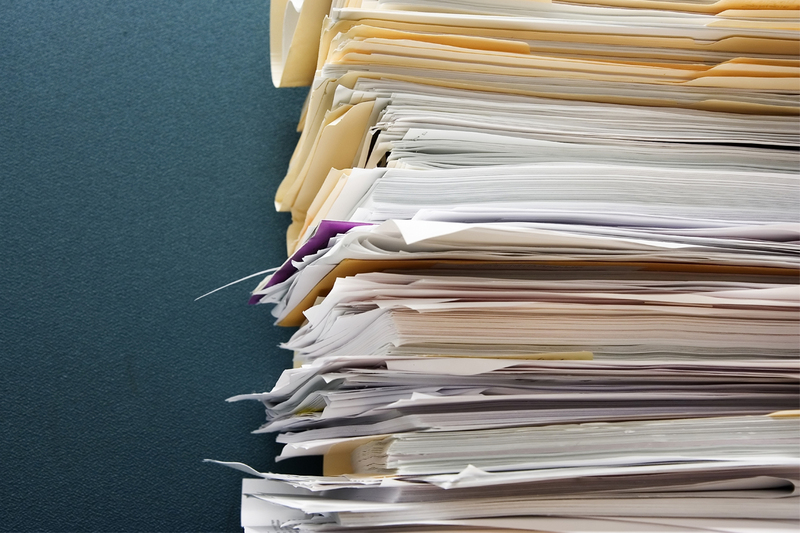 Bureaucracies love burying us under unnecessary documents and forms, such that the important stuff gets lost in their midst. It is so much easier to scan the important documents and set up a directory structure by organization (Medicare, Health Insurance), year, with special filenames for the really important stuff. It was so easy at work. At home, it is near impossible. Next: What am I going to do about shredding unwanted documents that have my Social Security Number and credit card numbers on them? 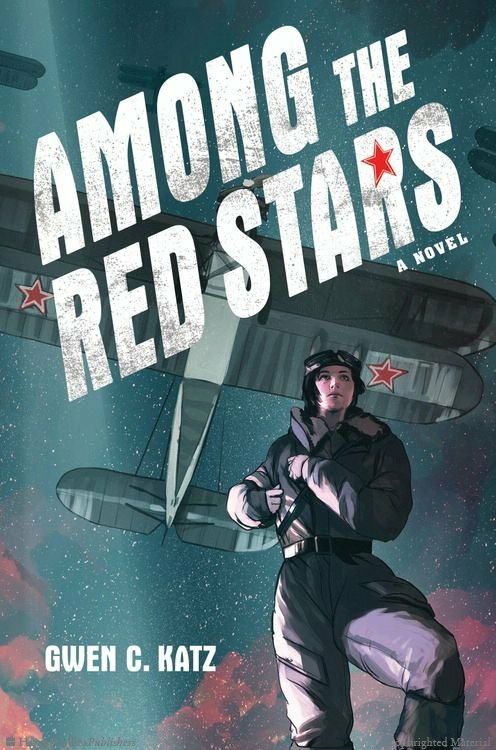 I don’t usually read Young Adult fiction, but circumstances dictated that I read Among the Red Stars by Gwen C. Katz. First of all, my friend Bill Korn recommended it to me and suggested that I visit the author at last weekend’s Los Angeles Times Festival of Books. The which I proceeded to do last Saturday. Gwen was there in a shared booth, and I purchased a hardbound copy of her book. Yesterday, I finally had a chance to start the book. Given Bill’s recommendation, I expected it would be interesting. It was actually written well enough to almost qualify as standard adult fiction. The book was about what the Wehrmacht troops invading Russia called the Nachthexen, the Night Witches. The term referred to young women who flew primitive old bombers at night behind enemy lines. 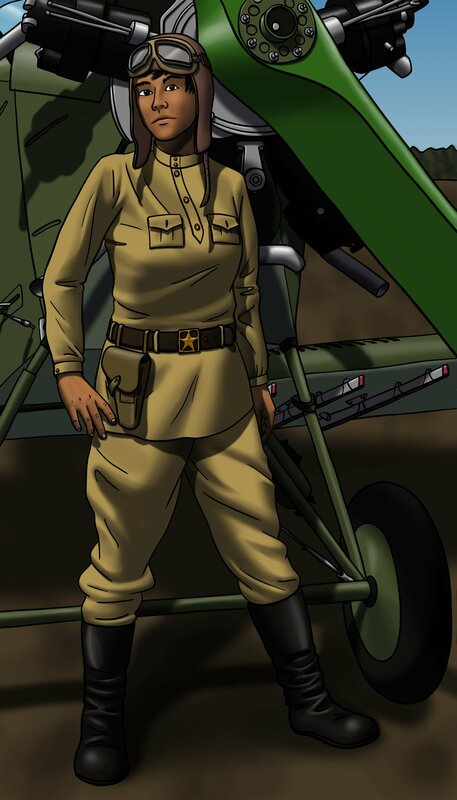 The heroes are Valka (Valentina) and Iskra, a pilot and navigator who knew each other from childhood. Valka corresponds with Pasha, a friend from her home town who is conscripted into a rifle company. Almost half of the novel consists of letters between Valka and Pasha, which gradually turn into love letters as Valka begins to realize how much her childhood friend means to her. Many of the events described as well as many of the minor characters are taken from real life. 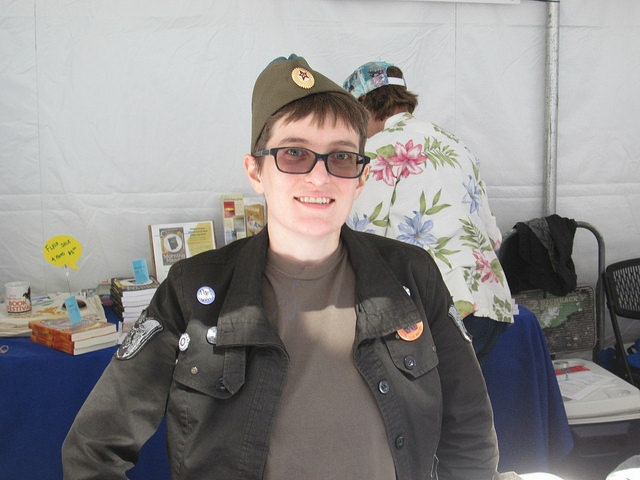 Although I do not know much about the women flyers in the VVS (short for Военно-воздушные силы, or Military Air Forces), I felt that Gwen Katz did a creditable job researching her book. Added to that were interesting and diverse characters and well-plotted-out action that was exciting without being too subject to shallow wish fulfillment. The ending, in which Valka and Iskra fly to rescue Pasha in German-held territory might be a bit much; but it is well within the standards of YA literature. I am curious to see what Miss Katz will do for her next novel. And I will be looking out for it. I was just looking through V. S. Naipaul’s A Turn in the South (1989) when a passage on page 57 suddenly struck my eyes. Toward the end of his life, Jorge Luis Borges was blind. During this time, he gave many interviews which were published (I have at least a dozen of them on my shelves). My guess is that he saw the interviews as an easy replacement for having to write the stories, essays, and poems for which he was famous. It was something I had worried about that these figures of Atlanta, because they had been so often interviewed, and though they might appear new to the out-of-towner, might in fact have been reduced to a certain number of postures and attitudes, might have become their interviews. Like certain writers—Borges, to give a famous example, who had given so many interviews to journalists and others who, in the manner of interviewers, had wanted absolutely the set interview, the one in the file, had wanted to leave out nothing that had occurred in every other interview, that he, Borges, had finally become nothing more than his interview, a few stories, a few opinions, a potted autobiography, a pocket personality. Which was the way, I had been told, the media created two or three slogans for a politician and reduced him to those easily spoken words. 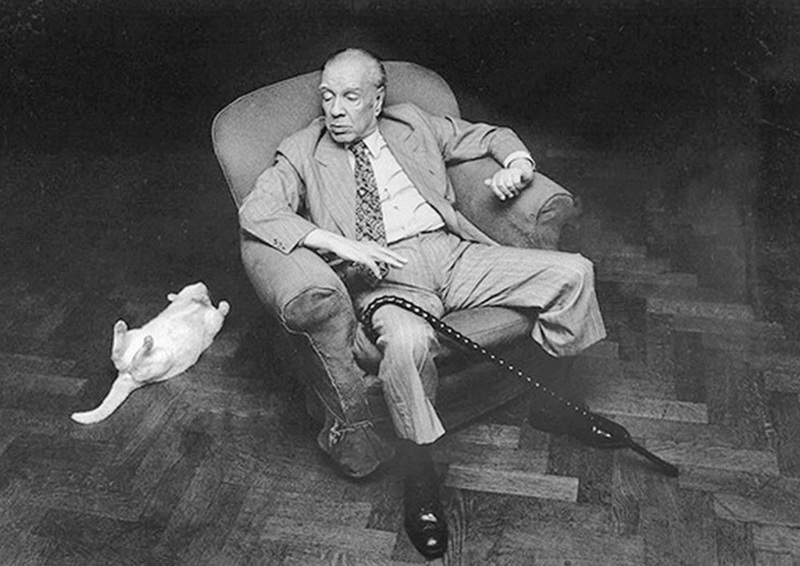 Fortunately, Borges was wily enough to give a series of varied interviews which, though they had some common elements, especially in the area of “a potted autobiography,” are still capable of entrancing the reader. He started out as a student of architecture and ended up being a surrealist painter whose work has an architectural quality. Roberto Aizenberg (1928-1996) is the subject of this post, part of a desultory series on Argentinian painters. In general, I dislike abstract expressionists and love realists and surrealists. A student of Antonio Berni, about whom I have written before, Aizenberg’s work is reminiscent of Xul Solar, another surrealist from the Rio de la Plata. 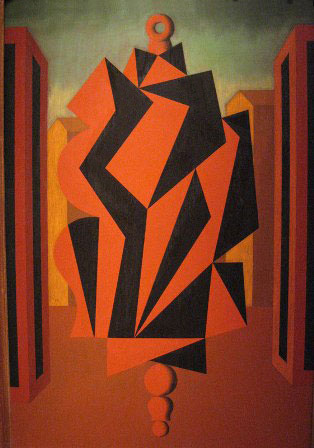 The above painting ties the artist’s love of architecture to the soil of Argentina, with the buildings appearing to be a range of buttes and mesas built atop red earth riddles with caves. This one particularly reminds me of Xul Solar’s surrealist humor. Harlequins typically wear costumes broken into a design of alternating black and white diamonds. Here, Aizenberg suggests the costume and brackets it with architectural elements. Instead of a human figure, the painter’s harlequin is topped with a doughnut-shaped ring and supported by three spheres of descending size—almost as if it were a decorative finial for a staff or scepter of sorts. I have not seen many original canvasses by Argentinian painters, with the exception of Xul Solar, whose dedicated museum I have visited in Buenos Aires. 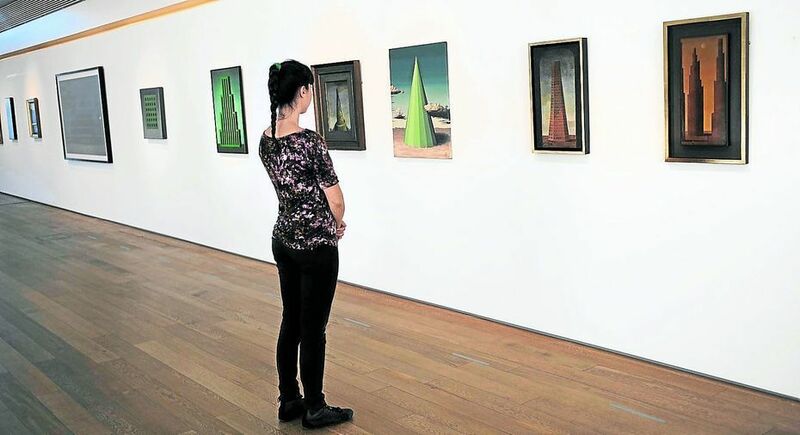 The next time I go to South America—and I hope there is a next time—I will have to visit MALBA, the Museo de Arte Latinoamericano de Buenos Aires. I decided to go today to the Farmers Market at 3rd and Fairfax to read a book of Umberto Eco essays and have a nice lunch. Although I finally made it, a number of obstacles arose. 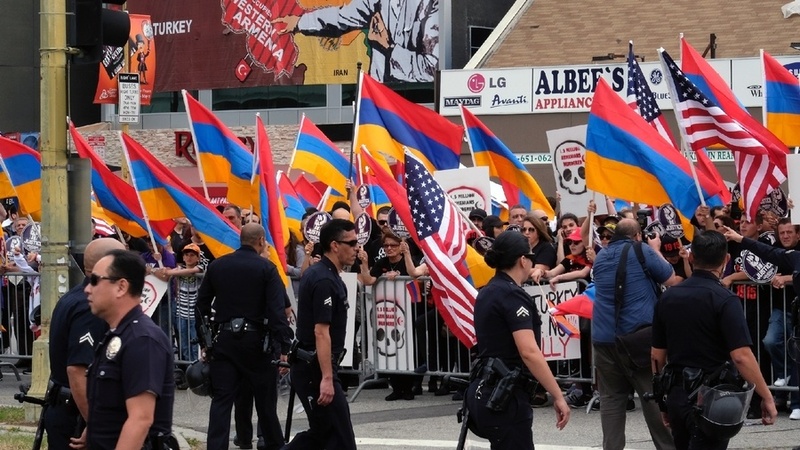 Today was the March for Justice to commemorate the 103rd anniversary of the Armenian Genocide by the Turks. 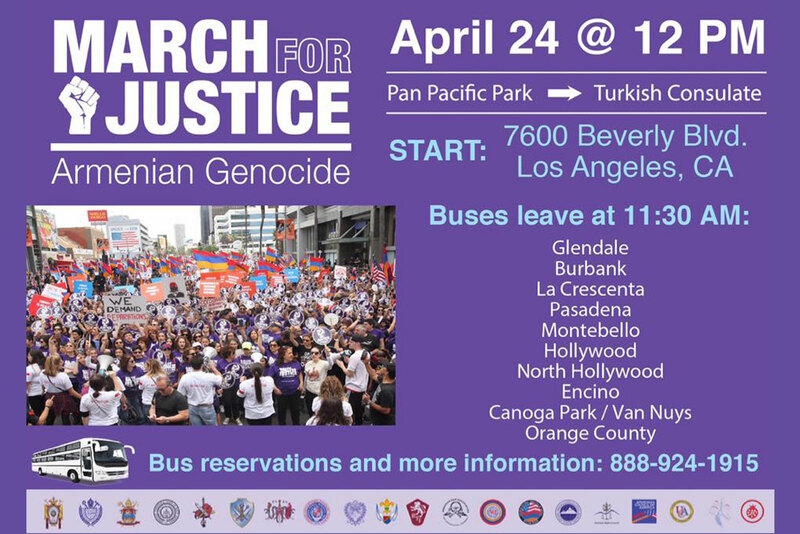 As there are a whole lot of Armenians in Los Angeles, there were numerous street closures and bus re-routings, including the MTA #217 that turned on Beverly Blvd rather than continuing south on Fairfax to 3rd Street, where the market is. In general, I find myself very pro-Armenian. Partly it is because Martine truly loves the way that Armenians prepare chicken. I am also pro-Turkish. I am against the genocide, but the guilty parties to that event are long gone. The Young Turk government of Enver Pasha was guilty of the extermination of 1.5 million Armenians. If you are interested in the subject, see Elia Kazan’s film America America (1963). So I am very anti Young Turk, but that’s ancient history, so it doesn’t much matter any more. What confuses me is that the current leader of Turkey, Recep Tayyip Erdoğan, refuses to own up to his country’s past infamies, of which there are many. Why? His government was not to blame for them. Southern California is full of ethnic minorities of all kinds, including a few racial ones as well. It makes living here interesting. And it makes for some fascinating cuisines. 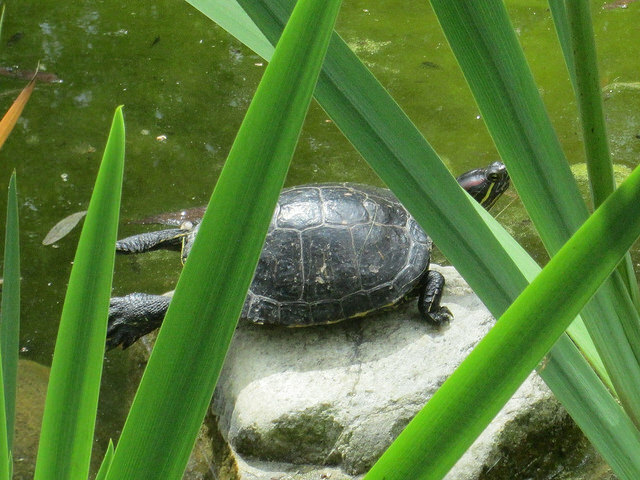 To the American Indian, the turtle was a means by which rain can come in a dry season. Although Southern California had some rain this year, it wasn’t much; and it looks like it’s over until much later this year or early the next. Fortunately, the mountains to the north, from which we get most of our drinking water, had a fairly wet rainy season. A Rain Turtle is a combined piece of American History from Indians & the Old West. This is what I have been taught about them. When I was a young man, & was taking an apprenticship in surveying, one of my teachers was a thin, OLD man that had been surveying since he was able to hold both ends of the rod off the ground. The old gent ALWAYS wore a white shirt, tie, kahaki pants, packer boots, and Fedora hat. He was in his 80’s when I met him…. He taught me that when the surveyors would survey boundaries & railroads across the old West, they often stayed with Indians, or had Indians accompany them on their long traverses across the American West. The story goes on to say that when an area needed rain, the Indians would make the outline of a turtle in the sand, generally facing West, as that is the direction the Rain God came from…. Once the Turtle was drawn, the Indian would drive a stake of wood through the center of the Turtle. Often times, it rained instantly. The Indians took it for granted that the process worked & wondered why the “Dumb Ol’ White Eyes” would not use it when they needed the Rain God to appear! Word of this phenominan [sic] quickly spread throughout the tight knit group of surveyors in the Old West. They quickly picked up on the trick & became apt at performing the simple cerimony [sic]. As they traveled through the West, they came across towns that severely needed rain for their crops & livestock. The surveyors were readily there to make a rain turtle & bring relief to the community….. When the Survey Party proceeded to move on from the town, often, there had been a collection of baked goods, some money, chickens, things brought to the wagons the surveyors used, by the townspeople in appreciation for the rain. In my crowded little apartment, I have numerous turtles, most of which were fashioned by Indians. In the weeks to come, I will photograph them and present them in these pages. It will be my own ceremony for rain-making. Maybe it’ll work; maybe it won’t. Doesn’t matter.